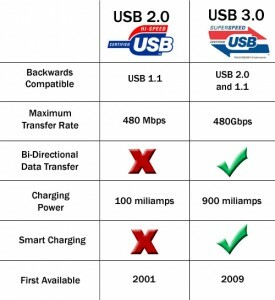 Do you know the difference between USB 2.0 and USB 3.0? You can determine the type of USB device you have by it’s connectors! You have all seen those new USB devices with the stylish blue connectors. If you look closely they also have two extra pins. The blue color is a quick and simple key to help you recognize that you have a USB 3.0 Cable/Device. 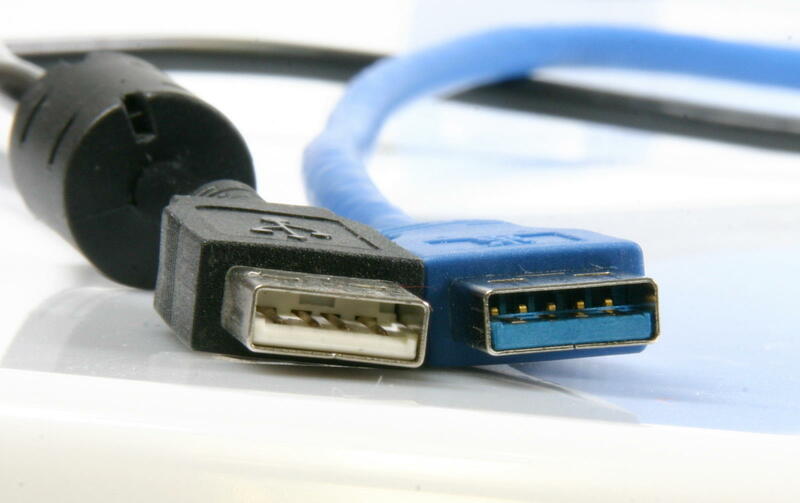 Typically the blue portion on a USB 3.0 cable or device is white or black on a USB 2.0 device. USB 3.0 Devices are capable of significantly higher throughput, but only if you connect them to a USB 3.0 port on your computer (shown below-right). Similar connectors are available on most laptops sold today. 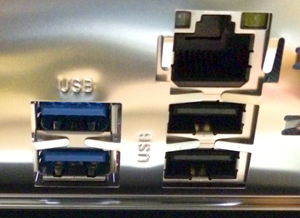 Again you can recognize a USB 3.0 port by the blue color or by the extra pins. The advantage to a USB 3.0 Device such as a hard drive or large capacity flash drive is speed. If your computer or laptop is USB 3.0 capable, and you connect a USB 3.0 device, you should see significantly higher throughput speed. If these are so great, why does my system have so many of those traditional 2.0 ports? USB 2.0 interfact ports are less expensive for the manufacturer to provide and they require much less power. These devices do not support bi-directional data transfer, but the manufacturer knows that for most of your USB devices like Keyboards, Printers, Mice, and Cell Phone Sync Cables you will not see any difference in throughput and USB 2.0 ports are all that is required. 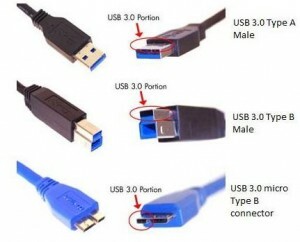 These legacy USB devices almost always have USB 2.0 connectors anyway, so connecting them to a USB 3.0 port would not provide you any of the USB 3.0 advantages. So Just remember, connect all your these legacy USB devices to your standard USB 2.0 ports and save those valuable USB 3.0 ports for those large capacity flash drives and that 3 Terabyte Hard drive you just bought! You do have a USB 3.0 3 Terabyte Hard Drive don’t you? How about a 64G USB 3.0 Flash Drive? Can I use a USB 3.0 cable in a USB 2.0 port on my laptop? I’m trying to find an adapter cable- USB 2.0 to HDMI, but can only find USB 3.0. I want to view video on my TV from my laptop. yes no problem, but you will only get 2.0 speed!